Dead tilapia float in the Salton Sea near Salton Sea Beach, California, in January 2011. 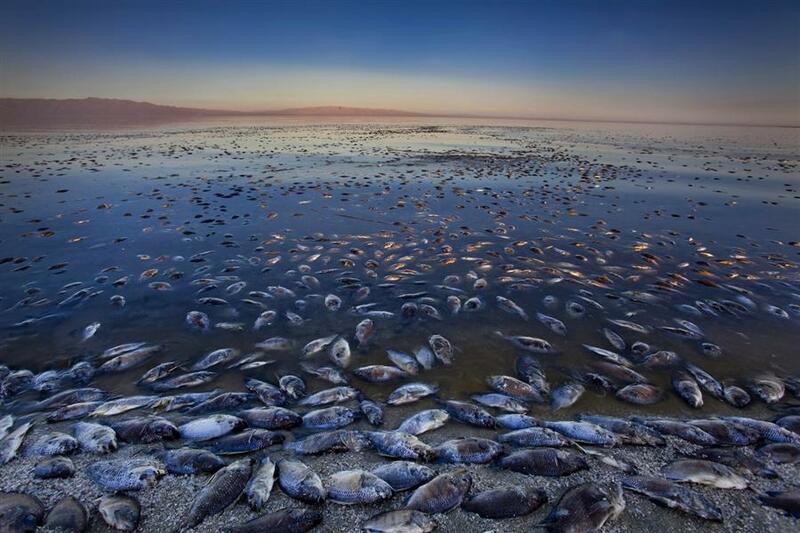 Erosion and high toxicity levels from farm runoff has left the Salton Sea increasingly contaminated, causing massive fish die-offs, and lake-side towns to become all but deserted. One of California's critical water sources, the Colorado River, is fast approaching a crisis. As we reported last week, the hope is that seven states on the river can agree to share water. But a Friday deadline passed without a completed deal, and now the federal government is ratcheting up the pressure. KQED"s Lauren Sommer filed this story for The California Report. Thousands of migrating birds have died at the Salton Sea this month. Officials say they believe it is the result of an avian bacterial disease KVCR's Ken Vincent has more. If the Colorado River runs dry, so would the economy of Southern California. A new report from Arizona State University quantifies the potential damage of water shortages by industry, and makes a strong case for keeping the Colorado River flowing through better management and data collection. More in this California News Service story from KVCR's Matt Guilhem.